Tests of the last prototype, the Calitoo in its present form (n ° 1) at the Canary Islands, at Izana mountain. Sur trois jours de mesures, les constantes d'étalonnage sont stables (cercle rouge). 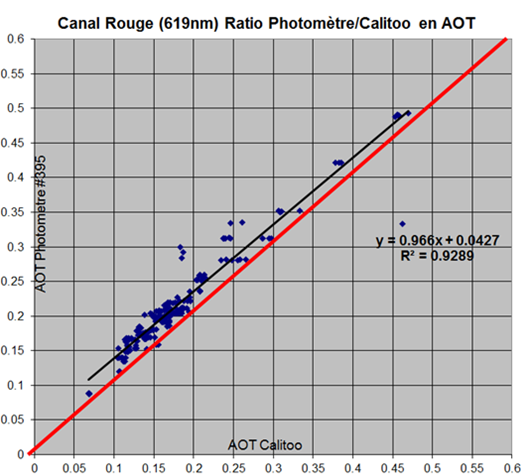 Cristina Borquez-Serna, CNES trainee, carried out a mission to the LOA in Lille to determine the calibration method that will be used for the CALITOO series produced by TENUM. 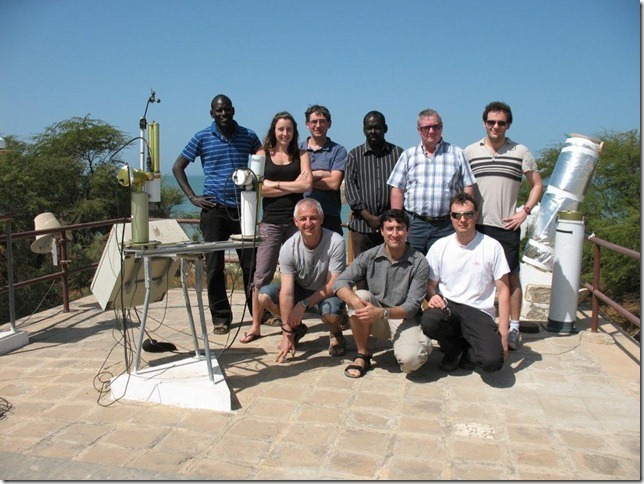 The team of the Laboratory of Atmospheric Optics (LOA) of Lille has just qualified our photometer after several months of work and measurements in different points of the globe. I take advantage of this end of Easter weekend and the moist night of Mbour (Dakar) to take stock of the latest measurements of Calitoo. We are currently on a three-week mission (the last one) to characterize an important event of dust (AOT of 1) that is still waiting. 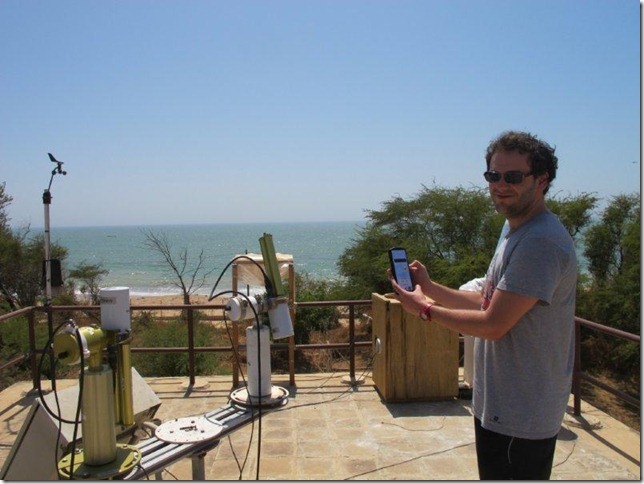 With the help of the permanent team I was able to collect a good battery of measurements. As agreed here are the (partial) conclusions regarding the measurements with Calitoo version fall 2012. Remote sensor to have a small FOV of 3.5 ° to 4 ° (already done in June 2012) and to approach the photometer Calipso-NASA: FOV = 2.75 °. Reminder: FOV 10 ° in April (The FOV of our photometers is 1.3 ° and 2.5 ° on Microtops / The sun has an angle of 0.5 °). Addition of a collimator (black paper) to limit the reflections. The results are much more interesting than the last time. Today the AOT seem (lack of dynamics -AOT <0.3-) correlated with the photometer. At the beginning of 2012 we had a comparison slope of 1.2 which is now 1. We still have an offset of about 0.03. This value is the absolute error of AOT. This is once the error is constant for all AOT. It can even be reduced by re-calibrating Calitoo on this photometer. It can also be said that the AOT has moved from 0.03 in 6 months as it was calibrated in October 2012. Moreover our photometers are calibrated to 0.01 of precision and that the current photometer of Dakar works since qq time is must return to be recalibré. I think we can say that Calitoo, as far as the AOT measure is concerned, is operational. Yes we can say it is OK.
We had an increase in AOT at the end of the mission (0.5). 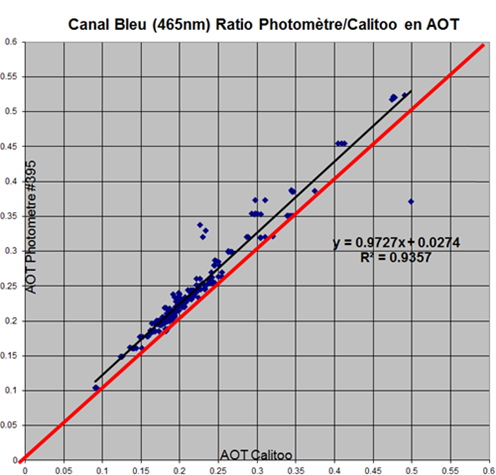 Attached are the photometer # 395 / Calitoo reports in Dakar in AOT cases greater than 0.3. I did not remove the aberrant points ! The slope of comparison remains around 1. We still have an offset of about 0.03 to 0.04 (because the AOT is more difficult to measure). 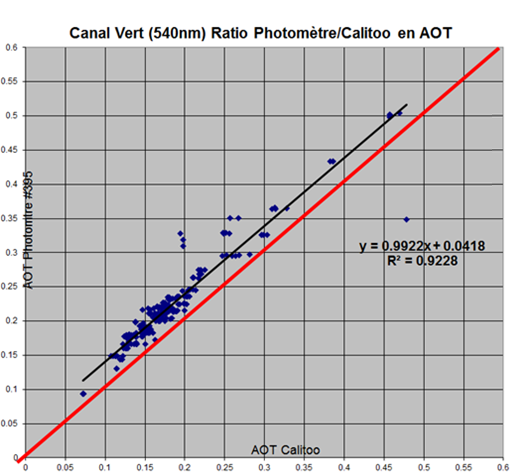 As soon as I have a little time I will relaunch comparisons by recalibrating Calitoo on the photometer # 395 to reduce this systematic (calibration) error. In short, for me, it seems valid even if we could still make measurements beyond 0.5. These are rare cases and if we were to go wrong from 0.1 beyond that remains very correct for a school instrument.